We will be set up vending our goods! Find us at this rad event! Farm OPS, a project of the Cornell Small Farms Program, is providing series of training workshops throughout 2019 for veterans interested in agriculture. Veterans interested in these programs must be enrolled at a VA facility in NYS (VISN2 area). Mushrooms and their Fungi relatives interconnect all other systems we are dependent on. We are part of a diverse web of life, those connections rely on each other for survival. They are the hidden life force of cells working together to connect life, restore balance, nourish and cultivate healthy systems. In this course you will journey through the complex web and ancient world of mushrooms. Explore how they grow in nature and then how they nurture us in return — forging our immune systems, circulation, anti-inflammation and more. Explore the many ways we can integrate Fungi into our regimens and systems. Mushrooms and their underground network of cells called mycelium are the unsung champions often missing from our studies, culture and horticulture practices. Learn the basics to recognizing them in the field, and explore different ways to grow them for food and medicine. Gain skills to get started incorporating mushrooms in your kitchen, garden and medicine cabinet. Everyone goes home with an Oyster Mushroom starter to begin growing their own mushrooms on waste streams and more. This workshop will be led by Olga Tzogas, owner and operator of Smugtown Mushrooms in Rochester, NY. Olga's journey with Fungi and plants started over ten years ago. Working with these allies by foraging in both urban and more wild settings, and developing skills to identify for food and medicine. In 2011, Smugtown Mushrooms was established because there was a need for mushrooms and growing supplies, workshops, events and community based science in her area. While continuously learning more and embracing the never-ending, unlocked potential of mushrooms and fungi. Olga teaches workshops about wild mushroom identification, medicinal mushrooms, biology, and mushroom cultivation. She was a core organizer for the 2016 Radical Mycology Convergence and the MycoSymbiotics Festival from 2015-17 and helped establish the first ever New Moon Mycology Summit in 2018. Recently over the past few years, she has been offering intimate guided journeys through the more feral regions of her ancestral homeland of Greece, focusing on the mushrooms, plants, natural history and the culture that weave through the different bioregions. This workshop will be held at the EquiCenter Farm, and lunch is provided. It is recommended that students arrive around 9:30 a.m. to get coffee, tea and snacks, and get checked-in and settled before the class begins. Take a look at the roles mushrooms play within our lives, the forest, and in food systems. Learn basic concepts of mycology, explore into their biology and ecology, and learn some basic methods for growing mushrooms in your garden or your kitchen. Mushroom growing supplies will be available for purchase. Spend the day celebrating the recent Spring Equinox the way nature intended; amongst the plants, mushrooms, friends & family! Smugtown Mushrooms will be teaching a workshop among other amazing teachers! The Forest Landowners Conference is the region’s foremost gathering of woodland owners, forest practitioners, forest businesses, and others interested in woodlands and the wildlife that use them. Nearly 740,000 owners care for Pennsylvania’s 11.5 million acres of privately-owned woods. Our goal is to equip a growing number of woodland owners with educational and networking opportunities to ensure continued benefits to and from these resources. Citizen science, fungi foraging and cultivation, prescribed fire, pollinators, and much more! This 2.5 hour class is brought to you by Smugtown Mushrooms and Reciprocal Roots! Join Olga and Kristin for an evening of solid mushroom and plant medicine talk. Bring your friends, a notebook, and all your questions about medicinal mushrooms and herbal medicine. We are pretty delighted to just drink tea with you, so we will be sure to have the nettle in the kettle! plus some long brewed Chaga tea. Lite snacks, tea + information for you to enjoy! Smugtown Mushrooms + Reciprocal Roots will have their homemade goods + medicine available too! Join Smugtown Mushrooms for an evening of immersion in to the healing power of mushrooms. Reishi is being put into everything from coffee to soaps to cosmetics. Journey through other divine healing heroes of the forest, the Turkey Tail mushroom, Lions Mane mushroom, & the common culinary mushroom, the Shiitake. Learn about how each of these mushrooms exists in nature, how we can cultivate a working relationship with them in our health regimens and of course keep them sacred and wild where they deserve to remain. Raising awareness of the growing market for these healers and what it means for us to do our part to grow our own, and explore the ethics of this huge growing industry. -Learn the basic lifecycle and biology of mushrooms and their Fungal relatives. -Learn how mushrooms exist in nature to better understand how they grow, and how we can apply these methods to our lives, agriculture, health regimens and more. -Journey through a few varieties of medicinal mushrooms that are commonly used in modern alternative treatment. -We talk about ways we can prepare and use these medicinals for both food and/or medicine. -Tastings of long brewed Chaga tea and freshly extracted homegrown Reishi tea. Journey through the complex web & ancient world of mushrooms. Explore how they grow in nature then, how they nurture us in return. Forging our immune systems, circulation, anti-inflammation & more. Exploring the many ways we can integrate Fungi into our regimens & systems. Mushrooms and their underground network of cells called mycelium are the unsung champions often missing from our studies, culture and horticulture practices. Learn the basics to recognizing them in the field. Explore different ways to grow them for food & medicine. Take home skills to get started incorporating mushrooms in your kitchen, garden and medicine cabinet. Journey through other divine healers in the wild, the Turkey Tail mushroom, Lion’s Mane mushroom, & the common culinary mushroom, the Shiitake. Learn about how each of these mushrooms exists in nature, how we can cultivate a working relationship with them in our health regimens and of course keep them sacred and wild where they deserve to remain. Raising awareness of the growing market for these healers and what it means for us to do our part to grow our own, and explore the ethics of this huge growing industry. -Learn the basic life cycle and biology of mushrooms and their Fungal relatives. -Journey through a few varieties of medicinal mushrooms that are commonly found in stores. -preparation of the first part of our Double extracted Reishi mushroom tincture, this involves processing the Reishi and storing & soaking it with supplied grain alcohol. -All attendees will enjoy will take home some dried Reishi mushrooms to begin your partnership with these healers. Her journey with Fungi and plants started over ten years ago. Working with these allies by foraging in both urban & more wild settings, and developing skills to identify for food and medicine. In 2011, Smugtown Mushrooms was established because there was a need for mushrooms & growing supplies, workshops, events & community based science in her area. While continuously learning more and embracing the never-ending, unlocked potential of mushrooms & fungi. Olga teaches workshops throughout the world about wild mushroom identification, medicinal mushrooms, biology, and mushroom cultivation. She was a core organizer for the 2016 Radical Mycology Convergence and the MycoSymbiotics Festival from 2015-17 and helped establish the first ever New Moon Mycology Summit in 2018. Journey through the complex web & ancient world of medicinal mushrooms. Explore how they grow in nature then, how they nurture us in return. We will discuss the deep history humans have with medicinal mushrooms & their power to heal. Identifying uses, and ways to prepare them. We will focus on their constituents and the diversity of properties within just a few selected varieties. Mushrooms are known for forging our immune systems, circulation, anti-inflammation responses & more. Join us this evening to journey through just a handful of medicinal mushrooms that grow locally in the wild, that we can even incorporate in our growing practices to lessen the impact of wild-crafting. Lets cultivate a working, sustainable relationship with them in our health care. Raising awareness of the growing market for these healers and what it means for us to do our part to grow our own, and explore the ethics of this huge growing industry. All attendees will enjoy sipping on long brewed Chaga tea and take home some dried Reishi mushrooms to begin your partnership with these healers. 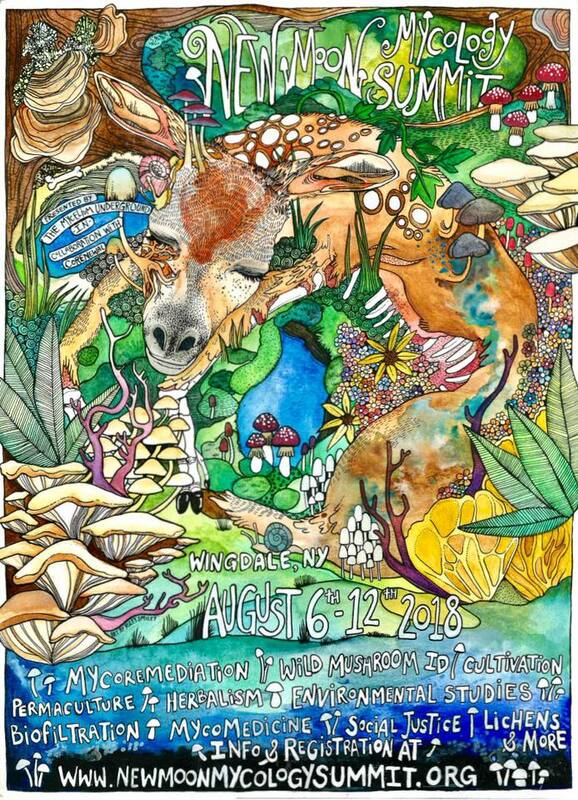 Excited to be hosted by everyone over at the Mid-Hudson Mycological Association ! Come explore the deep history humans have with medicinal mushrooms and their power to heal as we journey through this ancient world with Olga Tzogas from Smugtown Mushrooms. In this workshop, we'll identify common types, examine how they grow, demonstrate their uses and ways to prepare them. Learn who and what mushrooms are as we look at how they help forge our immune system, showcasing the diversity of properties within just a handful of selected varieties like the Turkey Tail mushroom, Lions Mane mushroom, & the common culinary mushroom, the Shiitake. We’ll further untangle the legendary “Mushroom of Immortality”, known as the Reishi or Lingzhi mushroom, put in everything from coffee to soaps to cosmetics as we assemble a double extracted tincture. Learn about how these divine healing heroes of the forest exist in nature and how we can cultivate a working relationship with them in our health regimens while maintaining their sacred and wild essence. Sip on long brewed Chaga tea and freshly extracted homegrown Reishi tea as we explore the ethics of this growing industry. We welcome first time hobbyist and veteran mycologists! The basic life cycle and biology of mushrooms and their Fungal relatives. How mushrooms exist in nature and how we can apply these methods to our lives, agriculture, health regimens and more. Journey through a few varieties of medicinal mushrooms that are commonly found in stores. Preparing these medicinals for both food and/or medicine. Preparing the first part of our Double extracted Reishi mushroom tincture, this involves processing the Reishi and storing & soaking it with supplied grain alcohol. Explore the wondrous world of fungi and learn how to grow and forage mushrooms with Farming the Woods co-author Steve Gabriel and Olga Tzogas of Smugtown Mushrooms. Four days of a deep view into the world of mushrooms, lichen & other fungal identification. This weekend goes beyond, just common edibles but rather is a training to acquire the confidence it takes to really start identifying mushrooms and other fungi for varied use and survival. A time and place where people can gather in the physical to re-energize, learn, exchange ideas, develop collaborations, and make connections, all with the spirit of reconnecting the disconnect in our culture, earth and communities. Although there is a focus on mycology, this event will be a platform for real change to take place and for people from diverse areas of expertise to learn from each other and to find common ground to solve real problems. This event includes workshops & other hands-on learning experiences that encourage learning, idea-sharing, healing, research and creativity. 2nd Annual Sam Ristich Foray NEMF Foray! At SUNY Geneseo, Geneseo, NY. The host clubs Central New York Mycological Society (CNYMS), Mid York Mycological Society, (MYMS), Rochester Area Mycologogical Association (RAMA), & Susquehanna Valley Mycological Society (SVMS) would like to invite you to join us to foray in the beautiful upstate New York area. any of our forays are scheduled for Letchworth State Park, nicknamed the “Grand Canyon of the East” and voted the best state park in the country in 2015. The Finger Lakes are another point of interest. State parks Taughannock and Buttermilk near Cayuga Lake boast some beautiful waterfalls. Wineries and breweries can be found down the length of these lakes. Many of these wineries have picnic areas with beautiful vistas overlooking these lakes. If you have time, cities to visit on the Finger Lakes include Geneva & Seneca Falls to the North, and Watkins Glen & Ithaca to the south. Geneseo is a small college town with a population of only 8,000. The National Warplane Museum is located right in Geneseo and will be performing an air show from July 13-15, 2018. The nearest city is Rochester, about 30 miles North of Geneseo. Rochester is filled with many parks designed by Frederick Olmsted, designer of New York City’s Central Park. In Rochester, he created what is known as the “Emerald Necklace” of parks along the Genesee River, the same river that runs through Letchworth. To see a terrific video by Richard Cook of the beautiful fungi-filled parks we will be visiting, go to the AREA ATTRACTIONS page. Campus accommodations – Dormitories are arranged in three and four bedroom suites . Two people will share a bedroom. Each suite has a shared common room and bathroom. We will attempt to put 4 people per suite, depending on quantity of people signed up. “Singles” would get a room to themselves, but will still share the suite. Linens and towels provided. There is no air conditioning, so you may want to bring a fan. Average temperatures this time of year are high of 81 and low of 61. As mentioned, meals will be cafeteria style with a buffet dinner on Saturday night. Meal times will be: Breakfast at 6:30am-7:30am, Lunch at 11:30am-12:30pm, Dinner at 5:00pm-6:00pm. These are serve times, seating time extends for another 30 minutes. Socials will run from 9:00 to 11:00. Alcohol – The college will allow you to bring alcohol into your dorm room. It is not to be consumed in open or common areas on campus. There will be a cash bar in the student union during socials and you will be able to take alcohol outside, onto patio, overlooking the valley. Commuter Option – If you do not want to stay on campus, you may make your own reservations at a local hotel or campground, and register as a commuter. Travel to Geneseo – Geneseo is just over 30 miles south of Rochester. From NYS Thruway Route 90, take 390 south to exit 8. Take 20A to Geneseo. From areas south, take rt. 86 (Former rt. 17) to 390. Take 390 north to either exit 7 or 8. From exit 7, take 63 north to Geneseo. From exit 8, take 20A to Geneseo. Join this AMAZING evetn, not to be missed! The festival has helped over 250,000 adults experience the wonders of the Hudson River from aboard the sloop Clearwater. The organization itself has gained worldwide recognition for its leadership in helping to pass landmark environmental laws, both state and federal, including the Clean Water Act. Recently, Clearwater played a key role in the Environmental Protection Agency’s (EPAs) decision to remove PCBs from the Hudson River. This decision compels one of the Hudson River’s biggest polluters to begin removing the toxic PCBs from the water, thereby expediting the amount of time before the river is restored. In 2002, Pete Seeger, the founder of Clearwater, was named a “Clean Water Hero” for his prominent efforts in the passage of the Clean Water Act. His tireless devotion to working through Clearwater and promoting its message to effectively use the law in prosecuting polluters of America’s waterways has made the Clean Water Act perhaps the most successful environmental law in the country. Today, seeing the success of the Clearwater organization, one cannot imagine these achievements being possible without the Clearwater Festival. The Great Hudson River Revival has helped raise funds and served as a beacon toward raising awareness in support of America’s First River. And it all started more than 35 years ago, when it was but the dream of a banjo-picking folksinger. Back in the mid-sixties, after centuries of accumulated sewage pollution and industrial dumping of toxic chemicals, the Hudson River, like many of America’s most important estuaries, was declared “dead”. The river’s fragile ecological system was devastated. Not a single fish was found in many areas, and the level of commercial fishing had¥dropped so dramatically as to be regarded as nonexistent. Recognizing this incredible social and environmental tragedy, Pete Seeger, a popular musician and respected activist, decided “to build a boat to save the river”. Holding small, fundraising river concerts throughout the Hudson River Valley, he literally passed his banjo among the crowd, collecting contributions to build the elegant tall ship that would become a symbol of environmental advocacy, the flagship of the American Environmental Movement, the sloop Clearwater. This nomadic folk festival picnic continued to travel through out the Hudson River Valley, then in 1978 the gathering set down roots at a historic river park, Croton Point, on the Hudson River and was coined The Great Hudson River Revival. However, ten years later, due to pollution problems with the landfill at the park, the festival was forced to move from the river. This move resulted in a decade of exile inland at a suburban college campus. In 1998, however, the Clearwater board of directors pushed to move the festival on or near the Hudson River, and a year later the Clearwater Festival returned to its spiritual home, the shores of the Hudson River at Croton Point Park. Since the 1960s, the Clearwater Festival has grown into the country’s largest annual environmental celebration, its music, dance and storytelling, education and activism attracting thousands of people of all ages to the shores of the Hudson River. Pricing is sliding scale and we encourage you to pay what you can. Join Olga Tzogas from Smugtown Mushrooms & Alex Dorr from Mushroom Revival for a full day, Outdoor Mushroom Cultivation class set and focused on urban or small farm production for hobby, permaculture and small scale commerical use. This day will be an extensive glimpse into many facets of mushroom cultivation that can be grown in the garden, indoors, greenhouses and shaded urban or wood lots. A lunch and beverages will be offered. Basilica Farm & Flea is part timeless flea and farmer’s market and part 21st century craft and design fair, showcasing the wealth and splendor of the Hudson Valley’s artisanal talents. Basilica Farm & Flea is inspired by the abundance of passionate and talented farmers, collectors and artisans in the Hudson Valley.